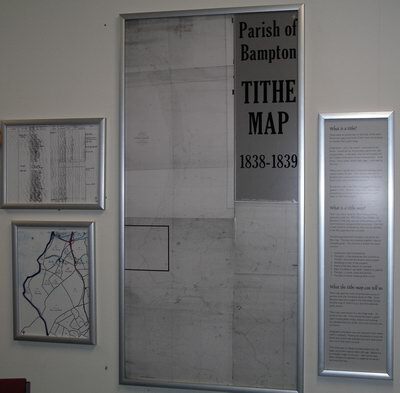 Bampton Tithe Map Full Schedule - long load time - 0.5MB. In the schedule tables, areas are listed in Acres, Roods and Perches (ARP). An acre is 4,840 square yards. A perch is equal to a square rod. There are 40 perches to a rood, and 160 perches to an acre. For convenience, the ARP area has converted into decimal areas and metric hectares. The amount due is listed in the schedule in Pounds, Shillings and Pence (£sd). For convenience, the £sd amount due has converted into decimal pounds. Tithes were an ancient levy on the fruits of the earth. Parishioners gave one tenth of their stock and produce to maintain their parish clergy. Great tithes – corn, hay, wood – were paid to the rector. Sometimes lay impropriators gained the right to great tithes – in Bampton, the Earl of Lonsdale and the Trustees of Bampton School received them. Small tithes – wool, calves, lambs, foals, eggs – were paid to the vicar. Tithes were originally paid in kind and collecting them caused endless trouble. Tithe owners searched for produce they suspected farmers of hiding and farmers found many ways of avoiding payment. To end the conflict, the Tithe Commutation Act was passed in 1836. Based on land values, tithes were converted to an annual money tax known as ‘corn rents’ or ‘tithe rent charges’. 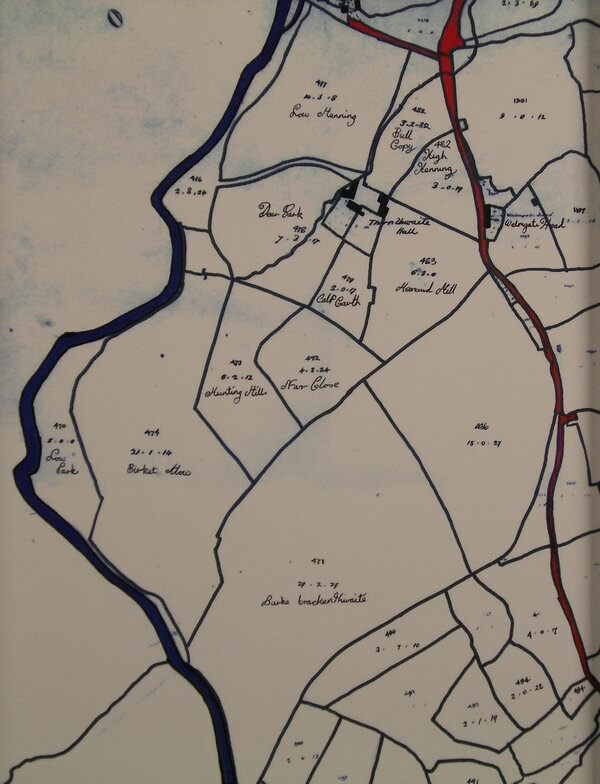 Tithe maps were made by Tithe Commissioners appointed under the 1836 Tithe Commutation Act. Bampton’s Tithe map was one of the earliest and the Commissioners’ seal guarantees its accuracy. Each field or plot of land is numbered so that it can be identified in the tithe apportionment schedule. Tithe maps give the most comprehensive survey of parishes since the Domesday Book of 1086. Since Bampton was not included in the Domesday Survey, the tithe map of 1838-9 is our very first systematic parish record. Tithe maps were drawn to a very large scale – 25 inches to the mile. They showed farmland in great detail including fields, tracks, streams and buildings. Uncultivated land such as fell, moor and common was not shown. Geographic orientation was not important (note where north is marked!). Marking the boundaries of even the tiniest strip of land was essential since land determined how much tithe had to be paid. The photocopy on display in Bampton Memorial Hall has been taken from the larger parchment original, faded with age. Beside it (also see below) is an enlarged image of one area – field names have been inserted and attached is a typed list of owners and tenant farmers.